All our dental professionals adhere to the rules governing the profession under strict guidance from the General Dental Council (GDC) "Standards for Dental Professionals". Darren is a highly skilled patient focused Clinical Dental Technician; he started his career as an apprentice Dental Technician working in NHS dental laboratory’s manufacturing dental appliances for dentists throughout Scotland. Darren is extremely passionate about his work. His main focus is on quality, providing fixed and removable treatment solutions for his patients. He continues to progress his knowledge on various courses throughout the UK and abroad, keeping up to date with the latest developments in dentistry. 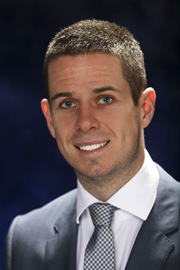 Darren graduated from Langside College in 2004, and then joined a successful private denture clinic in Glasgow making dentures direct to patients. More recently, Darren graduated from the post graduate Clinical Dental Technology course at UCLAN Preston. With Darren’s ability to do the clinical stages and technical stages of your treatment you can rest assured that you are in the right place for your treatment. There is great satisfaction in treating patients and making a real difference to their everyday lives. With originally coming from a technical background and now being qualified clinically to treat patients direct, I believe this new development in dentistry is a massive benefit for patients. The majority of patients that come to the clinic have presenting complaints about their current restorations, including the fit, comfort, appearance or function. In providing every patient with a consultation for investigations and a full mouth assessment, this enables a diagnosis of their current issues, allowing for suitable treatment options so the patient can choose their perfect solution. Darren is active away from the clinic, and enjoys training at the local Crossfit gym, as well as taking part in half marathons in Scotland throughout the year.